Expect a flurry of diplomacy leading up to Xi’s first state visit to Washington DC. Chinese President Xi Jinping has been in power for nearly two years (longer, if you begin counting from the time he took over as general secretary of the Chinese Communist Party), but he has yet to make a state visit to Washington DC. That is set to change this year, according to officials from both Washington and Beijing. On Friday, U.S. National Security Advisor Susan Rice announced that the Obama administration had invited Xi for a state visit, along with several other regional leaders. “I’m pleased to announce today that we have invited Prime Minister Abe of Japan and President Xi of China for state visits, and we look forward to welcoming other Asian leaders to the White House this year — including President Park of South Korea and President Widodo of Indonesia,” Rice said. China’s ambassador to the U.S., Cui Tiankai, also confirmed to reporters that Washington and Beijing are making arrangements for Xi to visit the U.S., according to China Daily. 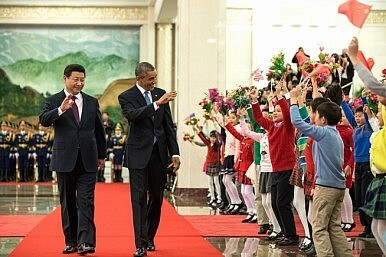 Xi’s visit follows Obama’s state visit to China in November 2014. There’s no word yet on when the state visit will take place, but September 2015 is one likely time frame. As Xinhua points out, Xi is expected to travel to New York City this September to mark the 70th anniversary of the founding of the United Nations. Obama also double-dipped on his trip to China last year, both attending the APEC summit in Beijing and holding a bilateral summit with Xi. If Xi’s visit comes in September, that means a number of other bilateral summits — Xi and Indian Prime Minister Narendra Modi, Xi and Russia’s Vladimir Putin (and possibly Kim Jong-un), and Obama and Abe — will take place first. Still, China ascribes a special importance to state visits, and the pomp and circumstance that come with that designation. In 2006, then-Chinese President Hu Jintao was famously denied a state dinner during a visit to Washington, D.C. The offense lingered until 2011, when the Obama administration hosted Hu for a full-on state visit. If Xi does visit in September, that provides a long lead-time for U.S. and Chinese negotiators to get down to business on agreements to mark the occasion. Last year, when Obama met with Xi in Beijing, the two leaders made a groundbreaking announcement on efforts to fight climate change. This year, the two governments might devote their energies to hammering out the specifics of the military confidence building agreements that were announced last November, especially agreeing on standards of behavior for unexpected encounters between U.S. and Chinese naval vessels and aircraft. More ambitiously, the U.S. and China might try to make concrete progress on negotiating a bilateral investment treaty (BIT). In 2015, both governments are expected to present their “exclusion lists” (lists of areas that will not see restrictions removed under a new BIT). Coming to agreement on the scope of those lists would be a major step forward in the trade negotiations. The last time the U.S. hosted a Chinese president for a state visit, Hu was on his way out and sought to use the trip to showcase his handling of one of China’s most important bilateral relationships. This time, the situation is reversed; Obama, with less than two years left in office, will be hosting Xi, who will be China’s ruler for at least seven more years. It’s Obama turn to seek agreements and announcements that can help shore up his foreign policy legacy and prove that his approach to China has paid off. 5 Predictions for Xi Jinping's US State VisitNSA Susan Rice in China: Rethinking 'New Type Great Power Relations'Sunnylands 2.0: Xi, Obama to Meet Informally AgainObama, Xi Meet at Nuclear Security SummitWill Xi Jinping Visit North Korea This Year?